Description: BNSF 4940 kicks up more snow dust as it rushes its string of Triple Crowns through Norman. Description: A BN Executive SD70MAC leads this empty coal train off the Ft. Scott Sub. The car to the right is the PURPLE KIA that my co-worker and I were assigned to by the Lenexa, KS Enterprise Rent-A-Car. This shot gives a good overview of the 'Old Union Depot Interlocking' - thats what the tower in the background was for. Description: The BNSF is crankin' today...an eastbound stack train approaches led by a CSX unit that the pig train will unfortunately block from view. This happened about three times today. Description: Waiting for the green, a brace of four Dash 9's are leading an intermodal west through Tehachapi. 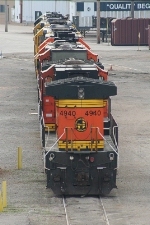 Title: BNSF 7702, 630, 4940, and BNSF ???? Description: Westbound intermodal Z-WSPNBY9-09 at Ormonde. Description: Burlington Northern Santa Fé. #4940 is the DPU at the rear of a freight train westbound passing milepost 921.27 at the Pond Rd crossing.